When it comes to great tea, water is of primary importance. Spring water or soft mineral water is ideal, but considering the cost of bottled water, it is much more cost effective to learn how to make your tap water fit for brewing tea. First of all, it is essential to remove the chlorine contained in tap water. If possible, put the water into a pot and let it sit for one or two hours before boiling. When the water has begun to boil, take the lid off the pot and be sure to let it continue to boil for a few minutes. If you use an electric pot, reset it to boil a few times. The ideal temperature for the water varies according to the kind of tea you are making, so it should be cooled to the desired temperature before it is used to brew tea. The vessels used for tea have always been an important part of tea culture. 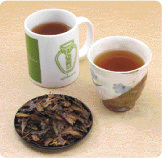 Certain teas taste better when brewed in certain types of pots and, likewise, when served in certain types of cups. 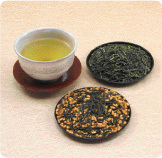 Fukamushi is best brewed using a teapot with a strainer installed inside at the root of a spout. Yanagi and Hojicha are best brewed in larger earthenware pots and served in cups thick enough to keep the tea hot without burning your hands.